Originally dedicated to Saint Mary, the first church at Notre Dame was opened for worship on the 13th September 1829. It was the only Catholic Church on the island until 1851, when the opening of St. Joseph’s Church caused it to close. In 1860, priests from Rennes obtained the permission to re-open the church, as a dependency of St. Joseph’s, under the patronage of Our Lady of the Rosary. In 1868, it regained complete independence. The French Church of Notre-Dame du Rosaire in the island of Guernsey was put into the charge of Pere Lecluze on the 7th of August, 1960, by Mgr. Guyot, Bishop of Coutances. The Channel Islands, although at one time attached to Coutances, are now part of the Diocese of Portsmouth, thus this occurred with the kind authorisation of the Bishop of Portsmouth. It is a reminder of the past that a Priest from Coutances has received the care of this Parish. Upon his arrival, the Church of the Rosary, 130 years old, was in a lamentable state, so Pere Lecluze made an appeal to one of his friends, Mr. A. Seguin, a young architect. Their first idea was restoration, but there wasn’t a halfpenny in the coffers! It was then decided to preserve only two walls, one of which was also the wall of the Presbytery. Mr. Seguin then produced some plans, which are also the fruit of his prayer and of his love. To reconstruct a church, when one has such a limited space, and with only two walls, imposed at acute angles, is not easy! Mr. Seguin, who holds a Government diploma, overcame the difficulties admirably. Situated in “Burnt Lane”, in one of the older quarters of St. Peter Port, it is difficult to reach. Stone steps at each end of the lane safeguard it from any vehicle, and ensure peace and quiet; but these same steps were the cause of great difficulty during the course of the Church’s construction. It took 94 hours to bring the new altar, weighing one and a half ton, up to its place! However there is a car park situated higher on the hill , which allows some degree of vehicular access. The Church restoration, begun in October 1961, was completed in December 1962. The first Mass celebrated on the Altar, for the intentions of all those who had allowed it to be realised, was the Christmas Midnight Mass. The altar was consecrated on the 4th August, 1963, by Mgr. Holland, Coadjutor of Portsmouth, in the presence of Mgr Caillot, Bishop of Evreux, who came in the place of Mgr. Guyot, Bishop of Coutances, and of many other famous people; religious, civil, and military representatives; eminent persons from France, England, and Guernsey, among whom must be mentioned General Catroux, Grand Chancellor of the Legion of Honour, who kindly wrote the preface to the booklet about Notre Dame. 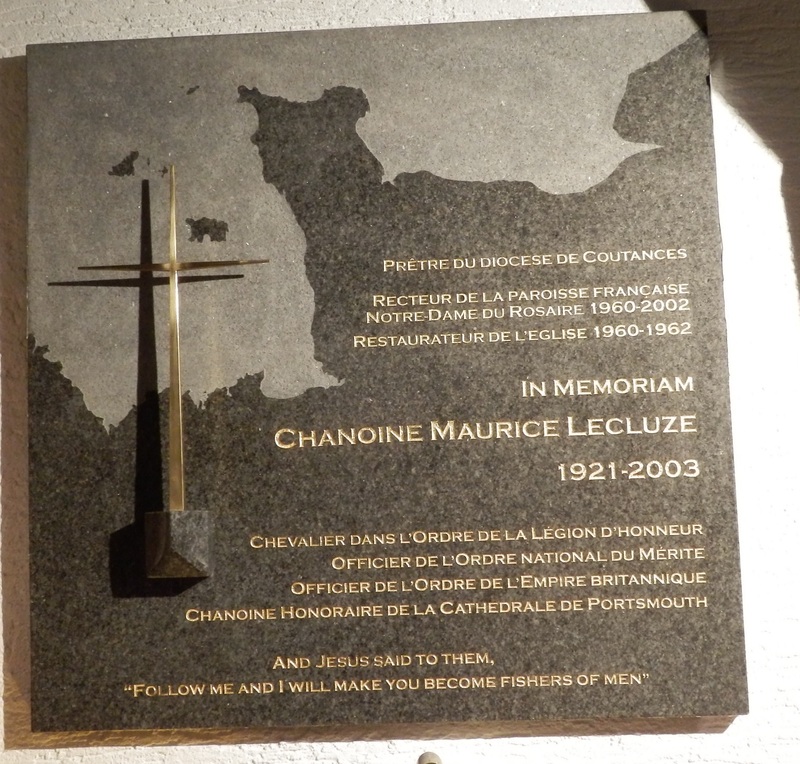 On the 22nd March 2014 a lasting memorial to the late Canon Maurice Lecluze was unveiled at Notre Dame Church. 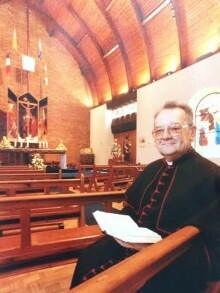 Pere lecluze came to Guernsey from France in 1960 and immediately set about rebuilding the church and presbytery, both of which were virtually inhabitable. He served the church and island for 42 years until poor health obliged him to move to a nursing home in France in 2002. In August 2003 he returned to Guernsey with the intention of remaining here in retirement, but sadly he died 2 days after his arrival. He was famed for organising music festivals throughout the summer months in which numerous world renowned musicians participated. He worked tirelessly to encourage interdenominational harmony in the island. In recognition of his work, he was awarded Ordre National du Merite in 1964 and the Legion d’Honneur in 1988. The rare distinction of an OBE to a non- British subject was awarded by The Queen and he was also made an Honorary Canon of Portsmouth Cathedral by Bishop Anthony Emery. The memorial mass was led by the Catholic Dean of Guernsey, Canon Michael Hore, at which Canon Gerard Hetherington spoke of all Canon Lecluze’s attributes including his priesthood, love of music and art and of his friendship.The memorial plaque was designed by architect Larry Malcic and was unveiled jointly by Sister Marie Paul, former headteacher of Notre Dame du Rosaire School, who travelled from Canada for the occasion and Liliane Lecluze, Canon Lecluze’s niece. Whatever Canon Lecluze put his mind to, he achieved. He was extremely focused and refused to let obstacles deter him. He was passionate about Notre Dame du Rosaire and about his ministry within the church. He was a respected priest and a well known character in Guernsey, and he has left a legacy behind him of which the parishioners and wider community in the island can be proud.